X is but one of many iconic characters gracing the packaging of Project X Zone (closer image here). Due on October 11, the first printing of the game will come in a special box that includes a character profile booklet and a "crossover soundtrack CD" featuring the game's background music. You better believe there'll be some Mega Man X tunes in there. Whether or not PXZ will release outside of Japan is still a looming mystery. That decision rests with Namco Bandai, not Capcom. Be sure to check out Andriasang's full report for more PXZ imagery. Of course he's on the cover. His name is in the title. 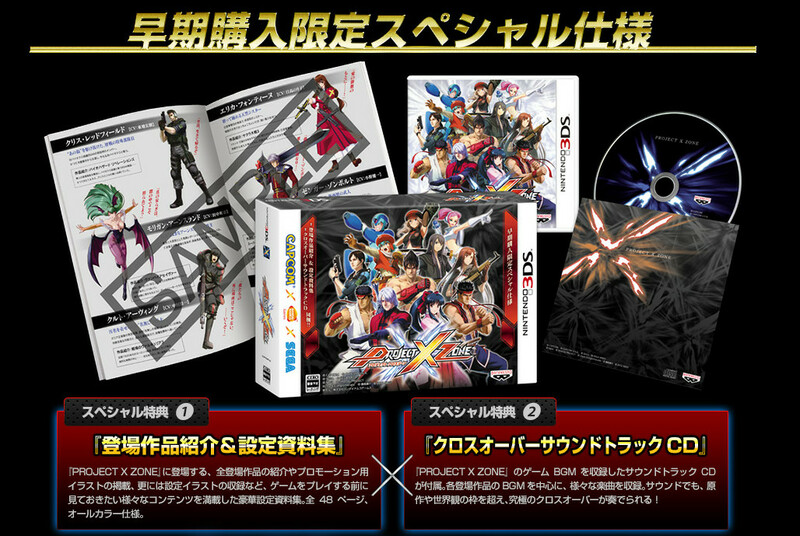 Anyone looking forward for Project X Zone in Japan? I love Rockman Cross! He's such a cool character! On a serious note, the fact that I haven't played through Namco X Capcom still bugs me. I watched a friend play back when it came out and it certainly looked fun enough to finish out. I'm going to go out on a limb here and say that the fact that Bandai is publishing the game in Japan does not AT ALL absolve Capcom (or Sega) or the blame for this game not being published anywhere else. The same company is not required to be the publisher of all regions; just look at The Last Story as a recent example. I don't give a damn who's publishing this game in Japan; I give a damn who ISN'T publishing this game elsewhere, and that's all parties involved. Period. Capcom's finger-pointing doesn't change that. @Hypershell: It may be a different case because of multiple franchises. Legal matters might be different. Anyone that followed the localization process of tatsunoko vs capcom knows fully of the legal issues with the tatsunoko characters. This would require all 3 companies in agreement as well as some franchises never left Japan and would cause problems for the respective company should they actually try to bring them stateside. Nintendo debut Marth in Melee in the USA and they did fine. June 28, 2012 9:51 PM Anonymous makes a very solid point, and anyone who wishes this game to be localized should read their comment. Capcom was certainly LUCKY enough just to be able to localize Tatsunoko vs Capcom. It's not a fact of them wanting to or not wanting to localize, it's a fact of how lucky and fortunate they can be with their efforts. Some people wonder why the localization of TvC lacks the animated scenes, or several characters (Like Hakushon Daimao the Genie). It's because legal rights dictated them, and Capcom had no real choice. Namco Bandai, Capcom and Sega could altogether put effort in getting past all of the localization obstacles, but I genuinely believe that localizing Project X Zone would be ten times harder than it was to localize Tatsunoko vs Capcom. In short, I just don't see it coming overseas at all, or ever. Call me a naysayer, fans can complain all they want, whatever, but it's just not feasible. You're better off just importing the game than to wait for a localization release. Too bad this game's never coming out stateside. Better drink my own--import a copy after release. It's a Nintendo product of course it ISN'T region free. You'd have to import both the game AND a Japanese 3DS just to play the thing. @Dr. Jerk: The ONLY obstacle is that all three companies would have to be okay with a localization. It's not at all the same as TvC, and if you want to think of it as being the same, then it'd be on a much smaller scale (3 companies compared to dozens). I don't see Capcom or Sega being big obstacles, either. Maybe Capcom, but it's a crossover, so maybe not. Honestly, to me it seems like Capcom and possibly Sega are already okay with a localization, and it's mostly up to Namco-Bandai. That's what I gather, anyway. Regardless, I still don't see it happening, especially not with several Namco characters that were never brought overseas. Namco was also in charge of distributing Namco X Capcom, and that never came to the US. I don't see it as a good sign that this game is also in their hands. General rule of thumb: If it's SRW related, it's not getting a localization unless Atlus or XSeed picks it up. And well. This is SRW related. SRW and NxC have been tied to the same multiverse. Said multiverse having hints at a massive overarching plot that we may or may not see within the next 20 years.